The weather is turning colder here now, so I have started to wear some of the things I enjoyed wearing last fall and winter. As was the case in the summer, I am discovering that some of those items no longer serve me well. As we age, the redistribution of weight on both our bodies and our faces makes a difference in our appearance and how our clothing fits. The title “The Next Chapter” pertains to the subtle changes taking place as I attempt to present the woman I am now in a more attractive way. When I edit the photos from all the recent shoots, it is undeniable that some of the items I enjoyed wearing last winter are no longer the best choices for me. There will soon be lots more items in the Shop My Closet portion of my website here. My style will still be a reflection of who I am but it will be a little more refined and less rock and roll inspired. For example, the blazer I am wearing here appears to be textured leather (it isn’t). The jacket is from last year via Dillards.com. You may be able to find one on eBay. It is by Antonio Melani. This style is more dignified than the leather biker jacket I ordered from Nordstrom earlier this year and promptly returned. When I tried it on the words “old hippie” came to mind. I knew immediately that I would feel silly each time I wore it. When I posted one of the images from this shoot on Instagram yesterday, several people wrote to ask how I tied the scarf and asked for the source. It is this one from my site here. I folded it into a large triangle and placed it around my neck like a bib with the point down the front. The ends are just wrapped around my neck and back to the front again. I like this simple way of wrapping a large scarf because you can adjust the neckline high or low as you wish. The gray tee is an old one from White House|Black Market. In the future, I will tuck it in and wear a belt. A less clinging fabric will be my choice the next time I purchase a similar tee. The proper foundation garments are more important than ever. I now only buy the Long Tankee bra by Shapeez (available at many boutiques and online). I often wear a camisole as well as the Tankee. My serums and moisturizers by Beautycounter here are replacing any face makeup/foundation and I am wearing much less eye makeup these days. Sunglasses are always on my face or in my bag. These are by Dolce & Gabbana. My eyes have always been sensitive to sunlight but even more so now. All of my slim fitting leggings and jeans are being replaced by the style of Sheri Slim Fit NYDJ I am wearing here. The handbag is old by Tahari. The boots are by Frye from last year. I do not accept paid advertising banners or popups, participate in collaborations, or do reviews of products or services. All opinions and insights shared here are my own. I am an affiliate for Covered Perfectly and French Kande. I am a Senior Consultant for Beautycounter. If you click on Ads or any of the links relating to those items on this site, I may earn a small commission from any purchase you make from those companies. If any product shown here was a gift, it is disclosed in the post. Do clue usin as your makeup routine changes! I, too, must wear eye makeup but it has to be done very carefully so my eyes look bright yet not overdone. And overdone is a very easy cliff to go over at our age. Thank you for pointing out that we should evolve in our style choices due to changing bodies. That is growth! Accepting maturity with grace is so attractive. I have noticed at least one “mature” blogger seems to still wear the same styles that were once attractive on her but are way off now. We ladies need to use our full-length mirrors and see how we are presenting ourselves. I love this look and agree with you about having a little bit of a heel. I am 70 now and still enjoy a a 1 or 1 1/2 inch block heel. And yes — flat shoes are necessary but finding ones that don’t make us look like we are wearing Army boots is challenging. I have found some very wonderful brands that look great! I️ have been following you for several years now and love your style and especially your philosophy on beauty and aging. This is my first time commenting here! I️ tend to be the quiet type. However I️ saw your blazer on your Instagram yesterday and now today and I️ was wondering who makes it and if it is still available out there somewhere. Thank you for your blog and your point of view. Keep doing what you’re doing I️ certainly appreciate it! The jacket is from last year via Dillards.com. You may be able to find one on eBay. It is by Antonio Melani. Susan, I don’t see a link for the blazer? It’s very attractive and I love your thoughtful comments. Keep going, girl!! 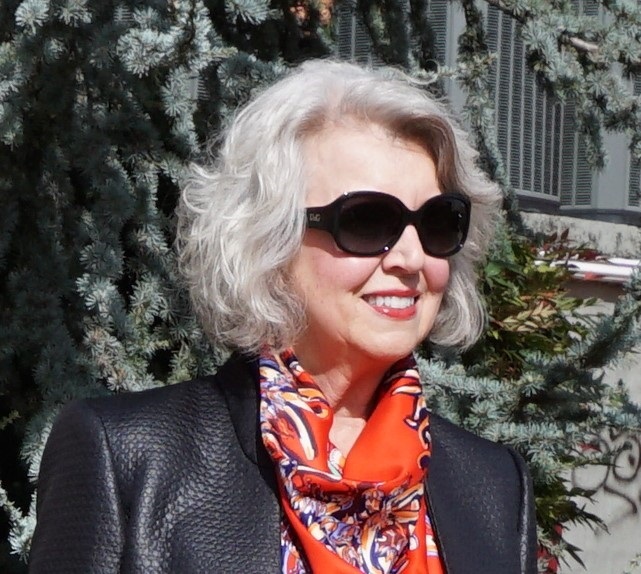 Susan, I love this look and would appreciate if you would tell me were I could purchase the jacket you are wearing. Thank you for all you and Mr. Mickey do, while maintaining a high degree of class and elegance. I really like the bright scarf with your outfit. Red is very becoming on you! Also, I think your hair has reach d that magic length now. Looks especially nice in your last picture! I’m a fan of nice full hair! Have a nice day! Raining and dreary in Delaware today. Susan, Thank you for once again sharing something I also noticed about myself. My weight is the same but my clothes fit differently. Will the tankee bra fit the same as a bra in my regular size? Susan, this is a beautiful look. Good advice. Question..the jacket looks like leather but I don’t think so. What is the material? The jacket is from last year via Dillards.com. You may be able to find one on eBay. It is by Antonio Melani. I am not sure what this material is, but it is not leather. I agree that our weight does indeed shift as we age. However, I do hope I will be able to wear leggings for awhile yet. I love the long tunic, leggings and boots. Its still what I am most comfortable in. I have never commented before, but I do want to say that this is one of my favorite posts ever! Thank you so much for putting into words what I have been thinking for the past year. It’s time for some of my clothes to be retired. I feel uncomfortable and a little bit ridiculous every time I wear leggings and tunic tops or long sweaters, not to mention those uncomfortable skinny jeans. Thank you for giving me the courage to say NO to the items in my closet that I feel make me look silly. I am not my daughter, I am 66 years old and happy to be here! Love your posts by the way. Hi Susan — A really great, thought-provoking post on keeping focused on change. It is so easy to not even “see” how things are changing and getting into a rut which ages us even more. One question though: If you are changing all your leggings, etc. for a NDYJ look, then how are you avoiding all that bulky jean-type extras at your stomach area? (The belt loops, the bulky zipper, the big button . . . ) . You have always advocated the flat-lying waistband, no bulky pockets, etc. For myself, I have relied very successfully on your past suggestions for the flat-front looks. I still have my Jag jeans in a couple of style with the flat front. When I wear a shirt or top untucked, I will wear those. NYJD also had a pull on style. Thank you for your posts on updating your wardrobe to suit your age. I turned 60 this year and I’ve been going through the same process, so your posts definitely resonate with me. I’m finding I’m more comfortable in elbow-length or 3/4 sleeves, and less clingy fabrics. I’ve donated boxes and boxes of things that no longer suit me. 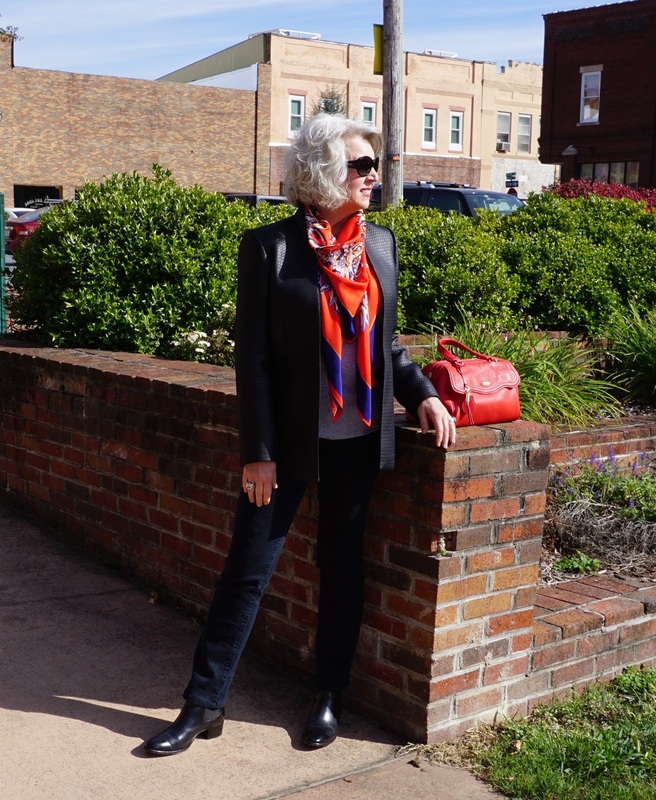 It’s difficult, I think, for most women to find jeans that fit well, and I wear a 34″ inseam, which makes it even more challenging, and I will not wear skinny jeans, which seem to be the most common style available right now. I can’t wait to see what you will be wearing this fall and winter. I thought you always looked fabulous in leggings and a tunic. I’m sure you will be looking just as fantastic. Looking forward to your future posts. Love the ‘not leather’ jacket you are wearing. Where can I buy that? Thanks. Can you tell us about how you are doing your eyes and lips with your new beauty line? I will write about that or share another video soon. Thanks! Look forward to it. I can no longer get either right. Thank you so much for your tips on style and skin routines as we age. I am just a year older than you and built pretty similar to you and have had a hard time finding what looks best for me and what I like. I have been looking for “leggings” and longer tunics but do not like the look on me. It is so frustrating trying to find my style. Thank you for your almost daily posts. Wow! You do not mess around! You make an important point about the need to constantly reevaluate our look, or we are in a time warp. Photos have a way of revealing what mirrors might not. I think you still rock the leggings-with-tunic look, but a critical eye is what makes you a style role model.I am going to check out the nydj style you wear. Keeps those tips coming! Yes, our bodies change regardless of our weight (which sometimes comes without invitation!) Sponge Bob Square Pants and I now have the same body shape! At 69, I have found that heavier, less clingy fabrics are more my style. Susan…..I hear you!! 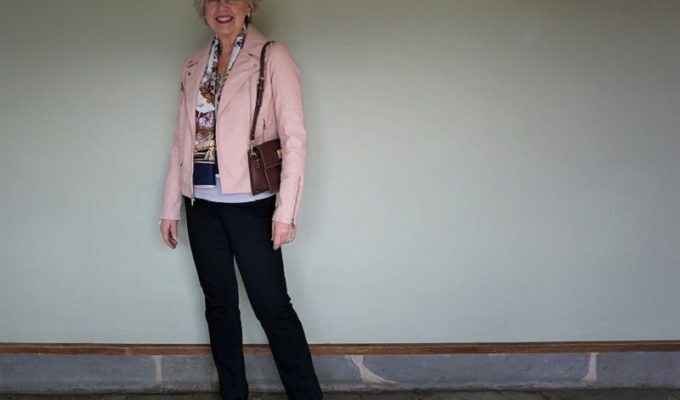 I am 69 now, and have to keep reminding myself to ‘accept gracefully’ the bodily changes that come with age……One of the most difficult is accepting that I no longer have a slim waist! I’m very active, swimming a mile 3x a week, and I’m in an ‘over 50’ tap dancing troupe which performs at senior communities….I also am a very healthy eater…..And, yet, there are some things I just can’t control…..like my waistline!!!! I enjoy your blog and have taken many helpful hints……Thank you!! What about that charcoal Moto jacket you wore a few weeks ago? Will it still work without the “aging hippie” feeling? I really like the one you’re wearing today and will be searching for it. Thank you. The charcoal Moto jacket is soft and feminine. It will work for me because it isn’t bulky or harsh looking like a black leather jacket is. Susan, as always, this is a great post and got me thinking. However, I think you look great in leggings and tunics, especially with boots — so I am curious to learn why you think the look is no longer appropriate for you. 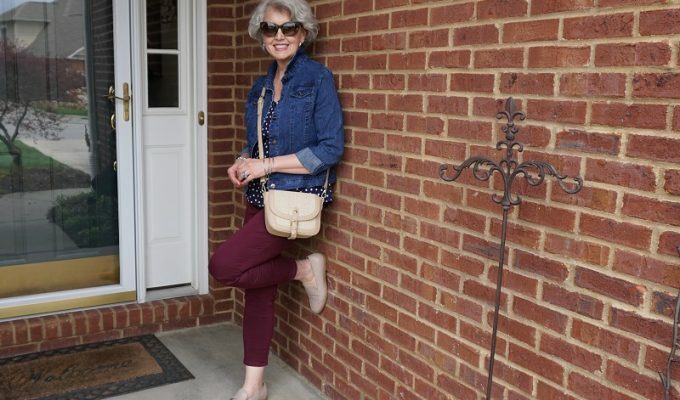 In so many catalogs and on so many blogs for mature women, leggings and tunics are still the featured styles. Again, I would like to hear more about why you feel they no longer work for you. Still learning from you — and thank you. It is the length of my legs that is the problem. If I wear a long top with leggings and low shoes, my legs look short and fat. I need to wear very high heels to balance things out visually. Thanks — I understand. But I still think you look beautiful and elegant no matter what you’re showing us! It’s reassuring to read that you are constantly reassessing what works and doesn’t work. Things change. It may take you a while to find out what shoes work best, but I can’t understand how people can wear ballet flats (or any kind of flat) with no arch support. A slightly raised heel or block heel works best for me and I supplement with cushioned heel pads. FitFlop (brand name) have introduced a lot of new shoes. I’ve always been a huge fan of their sandals and have now added two pairs of their Superskate which have a slightly raised heel and arch supports. I’ve been able to get some great sales at fitflop.com/. Thank you for the shoe suggestion. My pet peeve about women’s jeans and pants is that so often they have shallow pockets so items fall out. I do like somewhere to stash a lipstick, phone, key, and a slim card case with a little cash, a debit/credit card, and my DL. etc. and forego carrying a bag at all. Some pants for women have no pockets at all. Many athletic venues now have no wait lines for those who do not have a bag and that is the one I want to use! Are the pockets on the Sheri jeans deep enough to be useful? I can put small items in them without them falling out. Interesting about items no longer working for you. After several years of trying to wear what I lovingly call ‘Golden Girl’ clothing (unstructured jackets, flowy fabrics, etc.) I am back to my blazer style jackets, straight leg jeans instead of skinny leg and more fitted tees and shirts. My body shape has definitely changed over the years but what I feel comfortable in and what looks best on me remains the same as I wore many years ago. Seems like my size has changed but my proportions remain constant. Great post as usual. It is so comforting to know that many of us are facing the same challenges with our body changes, but that we can still look good following your lead. Wondering if you might do a post on suggestions for winter coats. I just cannot do the “puffer” look, I will not wear real fur, and I have not found anything in wool that looks any better than my 20 & 30 year old coats (which were worn only for a month or so each winter while I lived in TX.) Thanks. Hi Susan – I can’t tell you how much I enjoy your blog. I also want to say that I love the bright scarf and handbag. You look fabulous. You certainly do know how to present your best self, Susan. You look wonderful. Since I live in New Orleans where the weather can be very hot and humid, I must ask if you wear the Long Shapeez all year long- even in the hot summer? Yes, I do. It is lighter and much more comfortable than a regular bra. I used to live in New Orleans. I loved it! Laissez les bons temps rouler! Erk! Heel height & clingy tops, two things I’ve been fighting with this fall. I’ve been feeling more comfortable in a lower, chunkier boot heel for the past few months for some reason — not a flat, but no more 3″ heels for every day, either. As for the tops: I have this squishy midsection thing going on that wasn’t there last winter, & some of my light-weight white tee-shirts hug me a bit tighter than is flattering. So out they went. I picked up a couple of heavier ones that are looser around my middle: much better. AND I invested in 3 new bras, the total cost for which was more than my first car! But they hauled everything back up where they should be & the difference is noticable — even Himself had a cheeky comment or 2 to make. I’m still wearing leather biker jackets, though, even when we’re not on the bikes! My style is pretty casual — jeans & tees, for the most part — and let’s be honest: when you’re in your 60s & still roaring around on the back of Harley with a dude with a shaved head & full-sleeve tats, “dignified” sort of went out the window a while back. LOL! I just aim for “classy” & “holds up well” now & hope for the best! I’m a recent follower and I admire your classic look. I agree with you about the legging and long tunics and love the pants you are wearing. So glad I discovered your blog. You look beautiful, Susan. My first impulse was to defend how great you look in leggings and tunics, but I understand your response about proportion when you do not wear high heels. I learn so much from you and the responses from your readers. Thank you. Today’s blog entry is EXACTLY why I suscribe. You embrace the beauty of aging and look amazing! I agree with everything you said today and am experiencing the same changes you are. I say we embrace it and do the best we can with what we have! You nailed it today! You look stunning in that combination! Susan, where does one buy Sheri Slim Fit NYDJ? Leggings are definitely out for me. I’m so glad to see straight leg pants again! I bought mine from NYDJ.com and Dillards.com. Many department stores and boutiques have them as well. Is a gray tee one of the basics in your wardrobe? You mentioned you will buy the next one in a less clingy fabric. What fabric will you be looking for? I dislike clingy fabrics. I do love a good silver gray tank, long sleeve tee, and also a jacket if I could find one. The best for me is a light dove or silver/gray, not the marled type you would go to the gym wearing. Texture and color tone work wonders when you find the right one for you. A very important post .Thank you Susan . I think your decision not wearing leggings and tunics is the right one . Thank you for discussing this topic. There is an English expression “mutton dressed as lamb” that comes to mind. What it means is an older person dressed in a way that is appropriate only for a much younger one. I do find myself thinking about that before I buy something that is too much on point. Simiarly, I think it’s sad when someone dresses too old for their actual age. 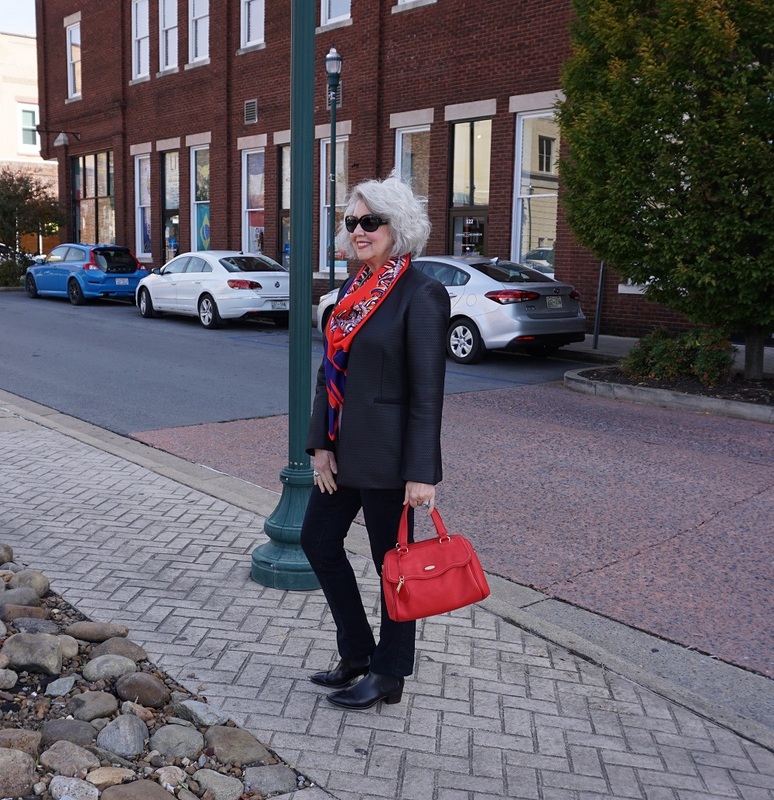 Unfortunately, it is sometimes difficult to find just that perfect balance because of what the stores carry, I recently tried to buy my mom an outfit only to discover Belk’s in our area no longer carries petite sizes. When I asked the clerk about the decision to discontinue petite sizes, she told me only old people wear petites. Are all young people tall? Does Belk’s only wish to sell to tall young people? She did say there’s were a few in the women’s section. But my mom is short, not fat. The young girl shrugged and said they wanted a younger customer so they don’t carry “old people clothes” anymore. Sad. That young lady would no longer be employed by Belk if management knew she had spoken those words to a customer. Very unacceptable but I have heard the same sentiment from other young people in numerous industries. I am looking forward to your metamorphosis. Nothing stays the same forever. Thank you so very much for your excellent blog! I much appreciate you addressing topics such as the involuntary shifting that happens to our bodies….plumping of face and middle…despite weighing less. No one else addresses such issues! Thank you too for your superior fashion advice, and sharing your reasoning behind it. 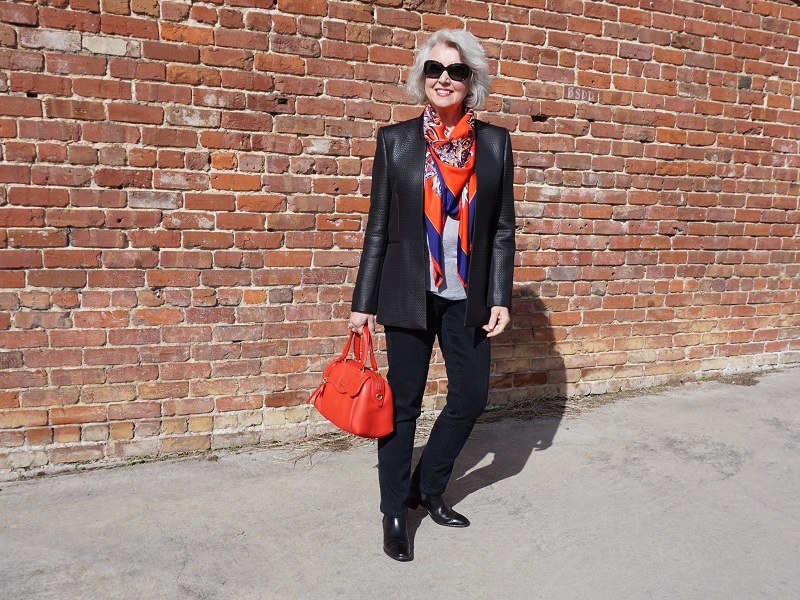 Your blog is a must read for all women over 50!!!!!! I read it regularly, and have followed you for a long time. Love it!! Why are you leaving your leggins behind? 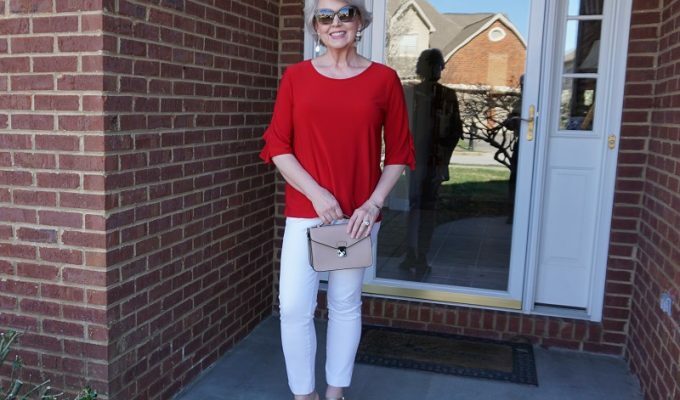 I am short, 5’2″, about 122 lbs;mmmm am wondering if all of us over 60’s, actually over 70’s should also do as you are doing. Living in Houston, Tx, we are often damp and humid while enjoying high 70’s and still some 80’s….. I am giving up the leggings because they look best with a long top that ends about mid-thigh. When I wear low heels with this look, my legs look very short and thick. Susan. I can certainly relate. I just this past 2 weeks packed up 2 drawers of jeans and pants that I am sure would look as perfect on someone else as they did on me when I first bought them. Also time for me to change a few looks around. So happy for the inspiration. Keep I‎t coming! I’m wondering why you feel that long tunics are “no longer your friend”? The combination without my highest heels, makes my legs look short and thick.